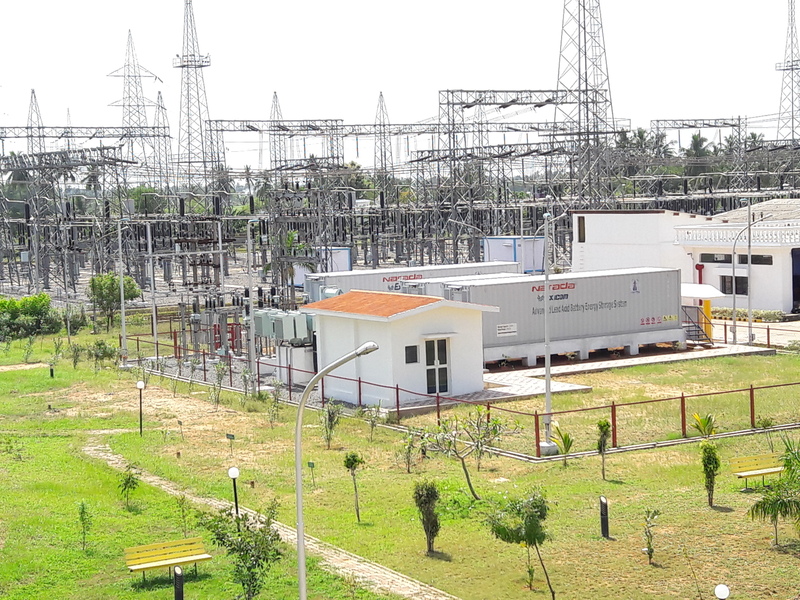 Recognising the increasing importance of Battery Energy Storage Systems in India, POWERGRID has established a pioneering pilot project demonstrating two battery storage system technologies (Advanced Lead Acid & Lithium Iron Phosphate) with battery management at Puducherry. The systems, of 250 kWh and 500 kW in size, are installed in one location and connected with the same feeder to provide identical grid conditions. They can therefore be compared on various parameters like overall sizing, efficiency, auxiliary power consumption, operational difficulties and maintenance requirements. While the units are relatively small for large grid storage management, this could be advantageous in the future as grids become less centralized, as well as for off-grid locations. The inclusion of multiple storage technologies along with grid management software will provide valuable data to enable grid balancing and facilitate wider deployment of renewables. The development of energy storage capabilities is crucial for the integration of renewables into the power grid or in off-grid areas. Silicon-air batteries have the potential to outperform current technology. They have a much higher energy density, are smaller and lighter than today’s lithium-ion batteries, as well as being environmentally friendly and insensitive to external influences. Silicon is also relatively low-cost and almost indefinitely available. On the downside, silicon-air batteries have a relatively short runtime The AlSiBat project is seeking to overcome this. Having discovered this weakness was caused by the consumption of the electrolyte, a pump system was developed to refill the electrolyte fluid as required achieving a runtime of over 1,100 hours. Ways to keep the battery running without refilling the electrolyte are now being explored. Seoul National University has developed an Internet of Things-based campus microgrid. It uses various resources including renewable energy to optimize power consumption and save energy. The microgrid analyses the characteristics of each load to develop precise campus models. Supplying surplus power from one microgrid to another microgrid manages the power consumption of the entire grid system, especially during peak demand. At the same time, technologies for effective load management and economic grid management can be developed. In the future, demonstration of microgrids needs to be conducted in a wide variety of conditions so that the economics and reliability of the campus microgrids model can be thoroughly verified. Virtual energy storage has been successfully demonstrated across two German cities, Herten and Wunsiedel. As part of a project, several small and medium-size prosumers and producers were bundled and participated in the energy markets. Both private and municipal plants formed part of the model, connecting households, electric vehicles and a public swimming pool, as great untapped storage capability lies in existing infrastructure. The virtual storage was adapted to market demand and participated in the spot market. This system could have a role to play in the rapidly changing energy supply sector with owners of CHP plants, heat pumps, night storage heating or PV-batteries motivated to promote clean energy systems.